Shale is a fine-grained, clastic sedimentary rock composed of mud that is a mix of clay minerals and tiny fragments (silt-sized particles) of other minerals, especially quartz, dolomite, and calcite. The ratio of clay to other minerals varies. Shale is characterized by breaks along thin laminations, parallel to the bedding. Mudstones are similar in composition but do not usually show layering within the zone. Geologists define clay as any mineral in a rock with a grain size less than 4 microns, even though the mineral may not be a clay mineral. Silt is defined as a rock with particle size between 4 and 62 microns. Silt sized particles are usually non-clay minerals and clay sized particles are usually clay minerals, although non-clay minerals may also fall into this category. The distinguishing characteristic of gas shales is that they have adsorbed gas, just like coal beds. They also have free gas in porosity, unlike coal, which has virtually no macro-porosity. The adsorbed gas is proportional to the organic content of the shale. Free gas is proportional to the effective porosity and gas saturation in the pores. From a petrophysical analysis point of view, clay-rich shales have traditionally been called “shales” and non-clay shales have been called “silts”. Petrophysical analysis deals with minerals, not particle size, so it is confusing to us when a zone is called a shale when the logs show little clay is present. An example is the Montney shale in northeast British Columbia. It is roughly 45% quartz, 45% dolomite, 10% other minerals (few of them are clay). 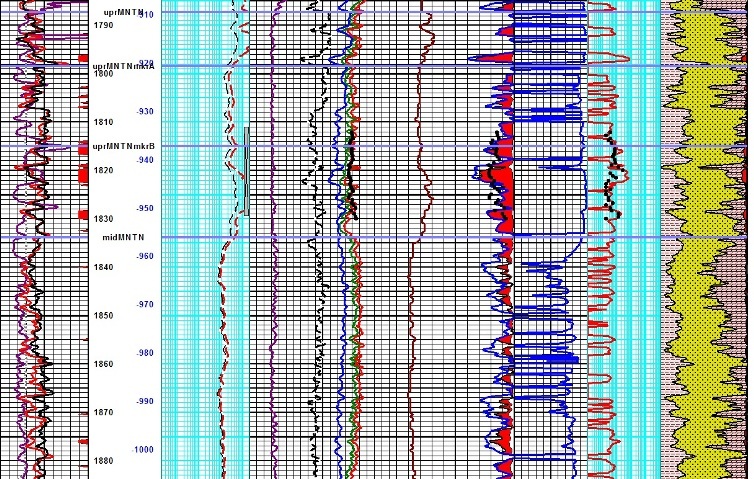 The zone is radioactive due to uranium (not due to clay), so it looks a lot like shale on quick look log analysis; density neutron separation and PE values are also close to shale values. This kind of reservoir needs to be treated as a tight gas sand, as there is very little adsorbed gas. Grain size definitions. "Clay Size" < 4 microns. 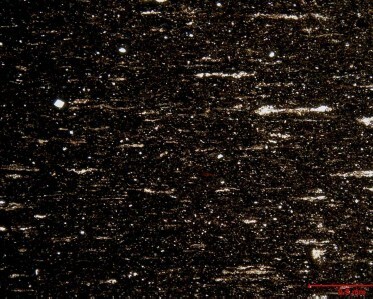 Resistivity scanner image of a gas shale with open (dark colour) and healed fractures (white). Other so-called "gas shales", such as the Monterey Shale, the Niobrara, and Milk River, are laminated shaly sands. These sands need to be analyzed with a Laminated Shaly Sand Model, not a Shale Gas Model. The sand laminations have good porosity and permeability. The shale laminations contain very little adsorbed gas. Others are radioactive silts with clay and kerogen, such as the Haynesville Shale, which is 50% clay and 50% quartz and calcite. This shale has low effective porosity and very poor permeability. Total organic content is moderately high and there is adsorbed gas, so it gets treated as a true gas shale. The Montney Formation in Alberta is totally different. It is roughly a 50:50 quartz dolomite mixture with 5 to 30% clay..Migrated secondary organic matter (bitumen and oil) matured into a range of environments, from the late oil window theough to the dry gas window. 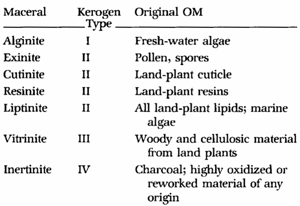 The present-day organic matter consists almost entirely of pore-filling pyrobitumen, liquid oil, condensate, and natural gas derived from the original liquids migration jnto the otherwise kerogen-lean reservoir. From a petrophysical point of view, the properties of pyrobitumen and kerogen are similar enough that we can still correct for either or both as long as we have some laboratory TOC data to calibrate our work. In the simplest case, the Montney is a tight gas sand; some act like tight gas with residual oil (pyrobitimen), and others may have some adssorbed gas in kerogen or in the nano-porous pyrobitumen. Using the wrong log analysis model, or the wrong assumption as to the character of the zone, will produce silly results, so be sure to understand what type of "gas shale" you are dealing with. Below is a table showing the physical properties of some genuine gas shale plays. Note the low values for free porosity, typical water saturations in the porosity, and the relatively low values of adsorbed gas in some plays. Production rates and costs are for vertical wells in 2008, after stimulation. Horizontal wells and massive hydraulic fracturing jobs make these zones more attractive. The best way to appreciate the unique properties of gas shale reservoirs is to look at the statistics, especially with respect to free and adsorbed gas, porosity, permeability, and costs. 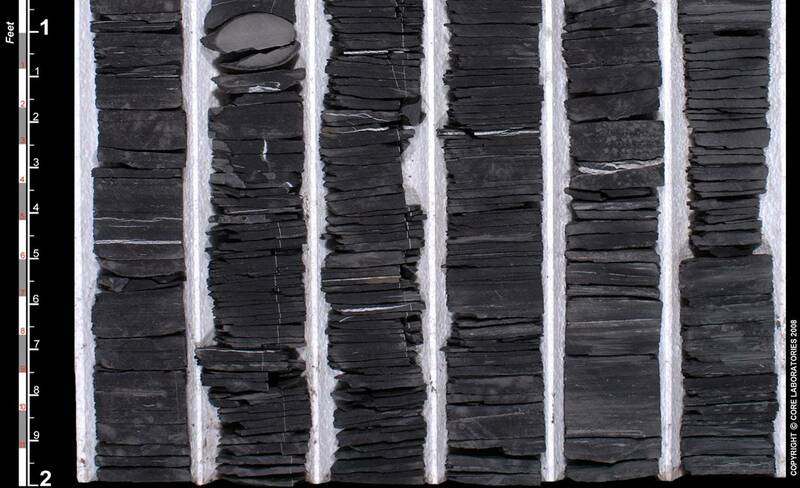 Below is a series of core photos of a gas shale showing the laminated nature of shale. Gas is adsorbed in the microporosity on the kerogen surfaces. The natural fractures along the shale partings help move gas to the well bore when well bore pressure is below formation pressure. Core photo of gas shale - about 50% clay, 50% quartz plus calcite, 10 - 15% total porosity, 3 - 6% effective porosity, < 0.001 mD permeability. 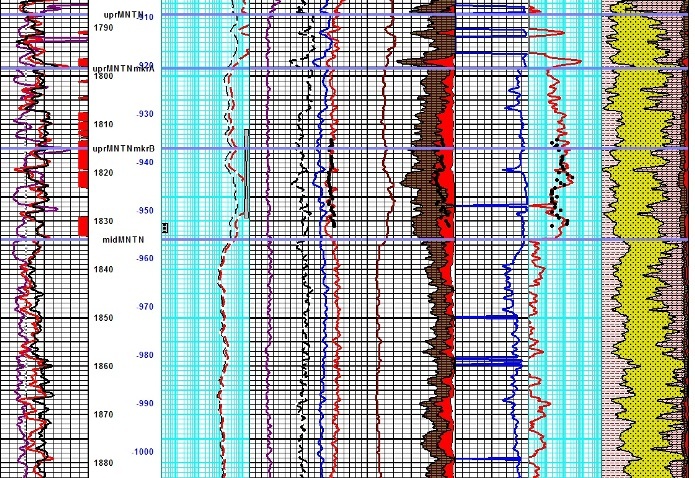 Visual analysis of logs for shale gas is difficult. Higher than average resistivity with some porosity on density, neutron, or sonic logs, and high to abnormally high gamma ray are the first clues. The resistivity porosity overlay described in the TOC Chapter is helpful. Quantitative analysis, described later on this page, will amplify your understanding. The "forgotten" log, the temperature survey, might be useful if some gas has evolved into the wellbore prior to logging. There is a temperature sensor on most modern logging tool strings - just ask for it to be displayed. 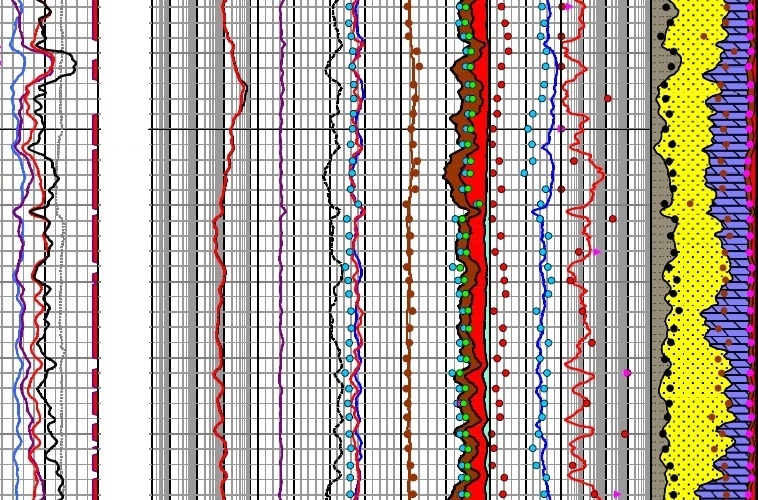 Temperature log from a gas shale in New York state shows a significant anomaly (red) compared to geothermal gradient (black). Perfs shown in depth track have IP of 200 mcf/d. Other log curves are (left to right: PE (0 -- 10), neutron, density (2 -- 3 g/cc), density porosity). Porosity scale is 0.30 to --0.10. Temperature scale is 80 -- 85 degrees F.
The logging program should include the normal full suite of resistivity, density, neutron, PE, sonic, and gamma ray, plus spectral gamma ray, borehole temperature, elemental capture spectroscopy (ECS), and nuclear magnetic resonance (NMR). Take care with interpretation of NMR results because the usual 3 ms cutoff used to find effective porosity (containing the free gas) may need to be shifted to 0 ms. The ECS is only needed if you want to run a multi-mineral analysis to find TOC and clay types along with the silt mineralogy. Gas shale contain predominantly Type II kerogen, as opposed to coal and coal bed methane reservoirs, which contain mostly Type III. 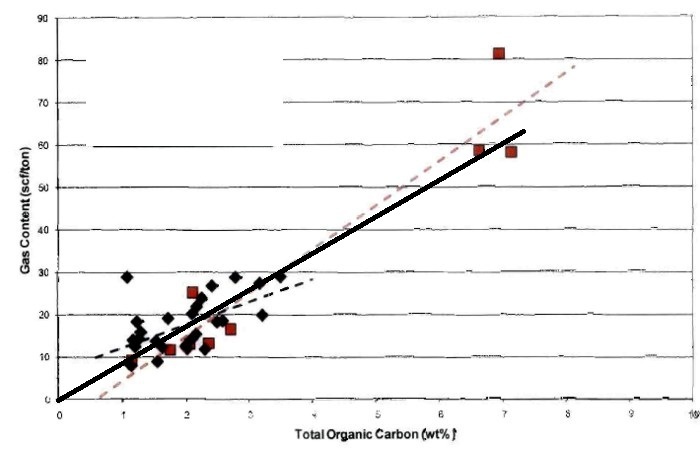 Various methods for quantifying organic content from well logs have been published. The most useful approaches are based on density vs resistivity and sonic vs resistivity crossplots. Other approaches using core measured TOC versus log data, for example density or sonic readings are also common. See TOC Calculation for details. Sorption isotherms indicate the maximum volume of methane that a gas shale can store under equilibrium conditions at a given pressure and temperature. The direct method of determining sorption isotherms involves drilling and cutting core that is immediately placed in canisters, followed by measurements of the gas volume (Gc) evolved from the shale over time. When the sample no longer evolves gas, it is crushed and the residual gas is measured. A detailed description of the lab measurement of adsorbed gas is provided in the CBM Chapter. 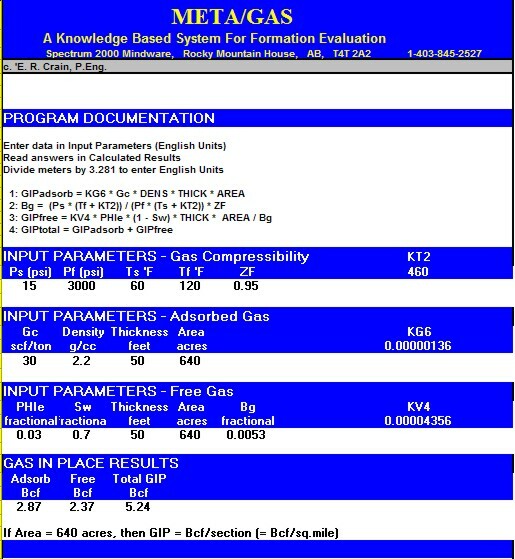 Gas content (Gc) results are usually given as scf/ton or cc/gram, as shown in the example lab report below. Multiply Gc in cc/gram by 32.18 to get Gc in scf/ton. 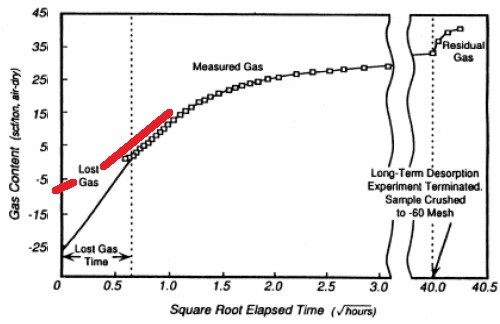 Example of Gas Content as measured in the lab in a shale gas interval. 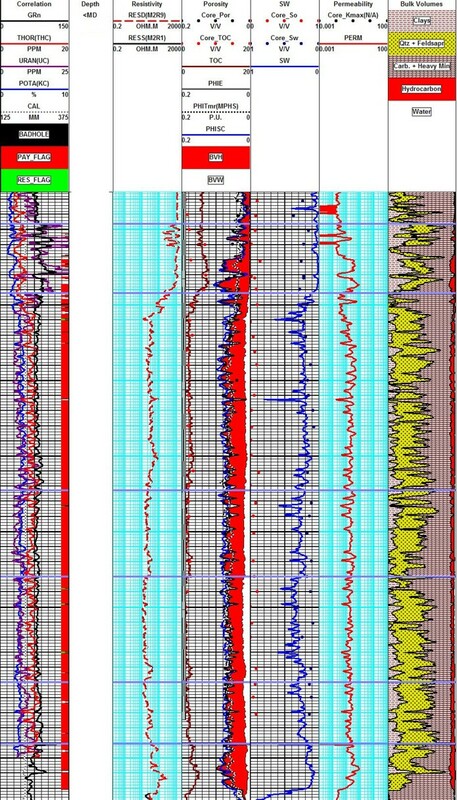 TOC derived from log analysis models are widely used as a guide to the quality of gas shales. Using correlations of lab measured TOC and gas content (Gc). We can use log analysis derived TOC values to predict Gc, which can then be summed over the interval and converted to adsorbed gas in place. Sample correlations are shown below. Crossplots of TOC versus Gc for Tight Gas / Shale Gas examples. Note the large variation in Gc versus TOC for different rocks, and that the correlations are not always very strong. These data sets are from core samples; cuttings give much worse correlations. 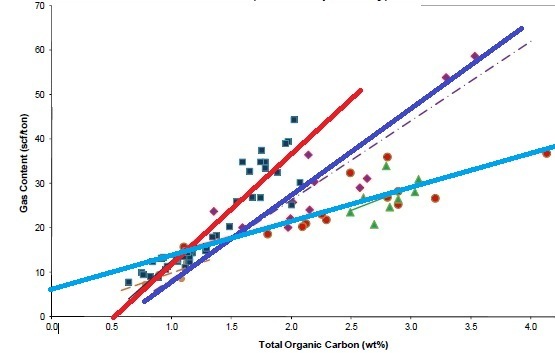 The fact that some best fit lines do not pass through the origin suggests systematic errors in measurement or recovery and preservation techniques, and erroneous lost gas estimates. Gas in place calculations in gas shales are done in two parts: adsorbed gas and free gas. Adsorbed gas in place is calculated from the actual gas content found in the lab or from a correlation between TOC and gas content (generated from lab measured data). Examples of both data sources are shown below.. Multiply meters by 3.281 to obtain thickness in feet. Multiply Gc in cc/gram by 32.18 to get Gc in scf/ton. Typical shale densities are in the range of 2.20 to 2.60 g/cc. Recoverable gas can be estimated by using the sorption curve at abandonment pressure (Ga) and replacing Gc in Equation 1 with (Gc - Ga). 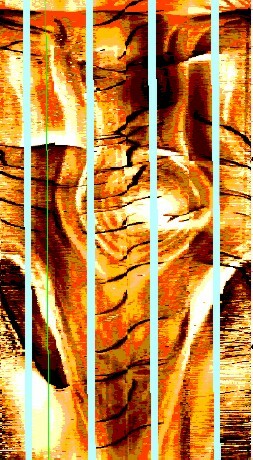 Free gas is determined by conventional log analysis using standard techniques, with the added complication of correcting for the kerogen and/or pyrobitumen volume, which looks like hydrocarbon filled porosity to the logs. Because porosity is very low, it is more difficult to choose the parameters than for conventional reservoirs. Small differences in parameters may have a large impact on hydrocarbon volumes. The log analysis model for shale gas is more complicated than for conventional reservoirs. The total organic content (kerogen) is the source of the gas and also takes up space. This space has to be segregated from the clay bound water and conventional porosity. The diagram at right illustrates these basic components. The conventional porosity can hold free gas and irreducible water. The clays hold the clay bound water, and the kerogen holds the adsorbed gas. Shale volume is the most important starting point, usually calibrated to X-ray diffraction or thin section point counts. The basic mineral mix is also developed from this data. 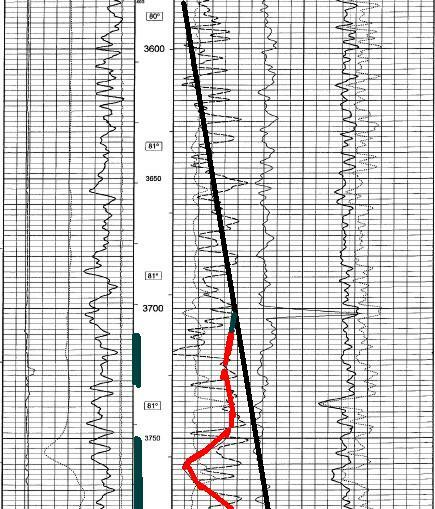 Unless shale volume is reasonably calibrated, nothing else will work properly. is usually in weight percent, so a little arithmetic is needed to get volume fractions. Shale volume calculation (be sure to adjust parameters by calibrating to XRD or thin section clay volume). Many shale gas intervals are radioactive due to uranium associated with the organic content. When the thorium curve is missing, the total gamma ray curve can still be used by moving the clean and shale lines further to the right compared to conventional shaly sands. Effective porosity is best done with the shale corrected density neutron complex lithology model. Here again good core control is necessary. PHINker is in the range of 0.45 to 0.75, similar to poor quality coal. PHISker is in the range of 345 to 525 usec/m (105 to 160 usec/ft), similar to poor quality coal. Effective porosity from a nuclear magnetic log does not include kerogen, so this curve, where available, is a good test of the the modified density neutron crossplot method shown above. This step requires careful calibration to core porosity, shale volume, and TOC. Some people use a multi-mineral or probabilistic software package to solve for all minerals, plus porosity and kerogen, treating the last two as "minerals". In the case of rough borehole conditions, this method gives silly results. Others use either density or sonic log analysis, using a fixed matrix value that includes the kerogen term. This is dangerous because variations in mineralogy and kerogen volume are not accounted for. Although the method can be calibrated to core inside the cored interval, a "one-log" approach is inadequate for such a complex environment. Some so-called shale gas zones are really tight gas with little kerogen or adsorbed gas, so the above equations work well because they revert to our standard methods automatically when Vker = 0. Water saturation is best done with the Simandoux equation. Dual water models may also work, but may give silly results when shale volume is high. Since the kerogen is not included in PHIe due to the correction applied to the crossplot porosity, standard water saturation methods are appropriate. In many cases, the electrical properties must be varied from world average values to get Sw to match lab data. Typically A = 1.0 with M = N = 1.5 to 1.8. Core analysis in low porosity environment needs some care and humidity control is important. 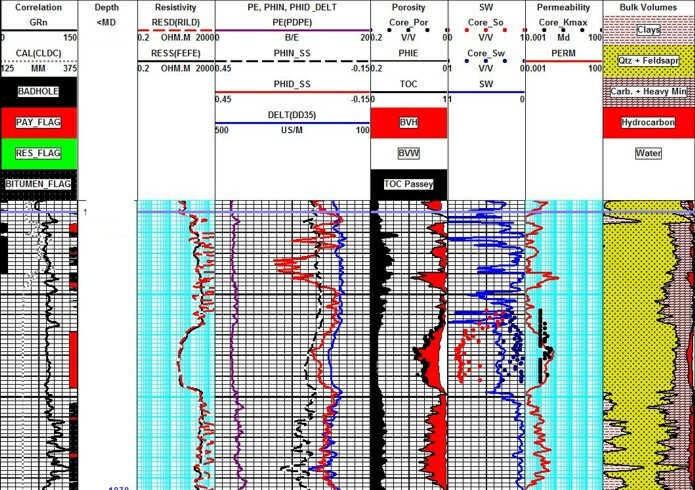 A sample of a "Shale Gas" porosity analysis is shown below. Tight Gas / Shale Gas core analysis for permeability variations with stress regime. Note the low water saturation, mobile oil, clay bound water, and the bound hydrocarbon. Capillary pressure data is needed to calibrate water saturation in the free porosity. Again, due to the low porosity, special lab procedures are needed. 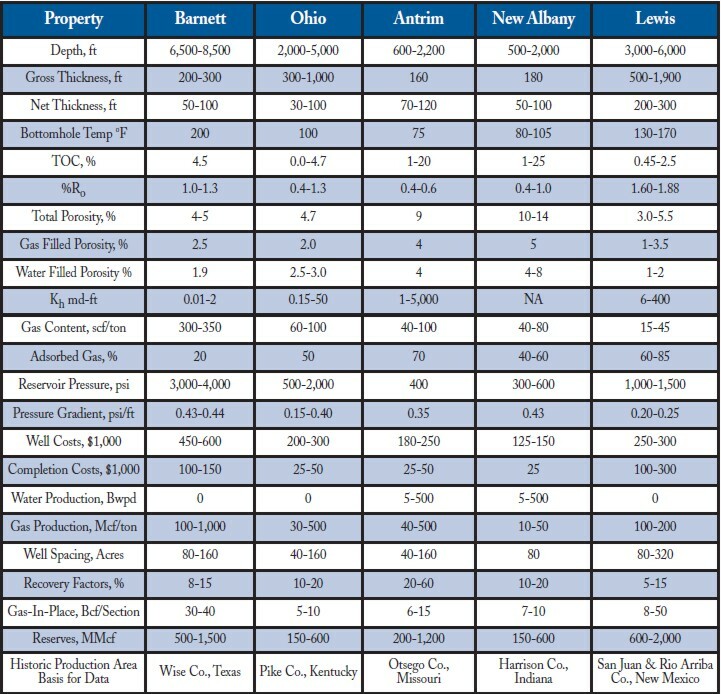 Some shale gas reservoirs have moderate to high water saturations, others can have very low values. Micro- and nano-CT scanning with post processing can generate all these values from core or sample chips. Example of a deterministic petrophysical analysis in a shale gas with relatively low clay and kerogen volume. TOC weight %, core porosity, core oil and water saturation, core permeability, and XRD clay and dolomite values are shown as coloured dots. The dark shading in Track 4 is the kerogen volume, red shading is free gas, and blue is irreducible water. Since the zone is radioactive due to uranium, clay volume is difficult to capture from logs unless a spectral gamma ray log is run, as was done in this well. XRD clay volume is used to calibrate this result. Similarly, the other minerals, kerogen, porosity, and water saturation are calibrated to obtain a good match to "ground truth". This spreadsheet calculates gas in place from both adsorbed and free gas derived from log or core data. The adsorbed gas calculation is the same as that used for coal bed methane. The gas content (Gc) value can come from a regression against TOC using core data for the correlation,. This regression can then be used with log derived TOC values. "META/GAS" Adsorbed and Free Gas In Place Spreadsheet. Sample output from "META/GAS" spreadsheet for adsorbed and free gas in place. This equation set is underdetermined, so some other data is needed. For example PHIe or Vker could come from relationships between core data and one or more log curves. Note that all “mineral” properties in the above are in English units and will need some adjustment to suit local conditions and to prevent negative answers. Vxxx = Volume of shale, quartz, limestone, dolostone, and kerogen respectively. Simultaneous equations can be inverted by Cramer's Rule or with spreadsheet functions to obtain the unknown volumes. Minerals chosen must be guided by local knowledge, based on petrography or XRD results. If a log curve is unavailable or faulty due to bad hole conditions, the data can be synthesized or the equation set reduced to eliminate that curve, with the loss of one of the minerals in the answer set. Clustering, principal components, and other statistical techniques are employed in some software packages and may work better than simultaneous equations. These examples are from Canada and represent what can be done with public data. Data deficiencies in older wells are notorious. In new wells drilled to these targets, much better sample, core, mineralogy, logs, and TOC / Gc data can be obtained. Going "cheap" on the initial delineation wells in these plays is not recommended. The log plots shown below illustrate the kerogen corrected density neutron crossplot model for porosity described earlier. The first plot shows a cored well, the second a cored well with NMR and ECS logs. Porosity results match core and NMR effective porosity quite well. TOC was calibrated to geochemical lab data and shale volume and mineralogy was calibrated to XRD data. The third illustration is a repeat of the first using a different porosity model. In this case the matrix parameters for sonic and density were chosen to obtain a good match to core data. This hides the kerogen correction and results may not be as accurate outside the cored interval due to clay and mineralogy variations. Sample log analysis of a gas shale with kerogen correction to density neutron crossplot porosity. Dark shading in porosity track is kerogen volume, red is gas volume, and white is water volume, the total adding up to porosity as seen by the density neutron shale corrected crossplot method. Left edge of red shading is effective porosity. Porosity scale is 0.20 on left and 0.00 at right TOC% is black curve on left side of porosity track, scale is 0 to 10%. TOC varies from 1 to 3% by weight. Core porosity (black dots) match effective porosity quite well, considering the laminated nature of the reservoir. 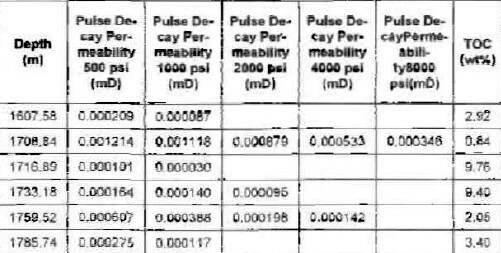 Permeability index calculated from effective porosity matches core data very well. This example is the same well as the first image in this series, showing results based on a fixed matrix density and matrix sonic travel time, used to obtain a good match to core in the cored interval. Both porosities are shown (blue is sonic, left edge of red shading is density). The kerogen correction is buried in the false matrix values required to get the results to match the core data. There is nothing criminally wrong with this approach when mineralogy and TOC are roughly constant, but that is not the case here. TOC weight percent varies from 1 to 3%, which translates into 2 to 7% by volume. 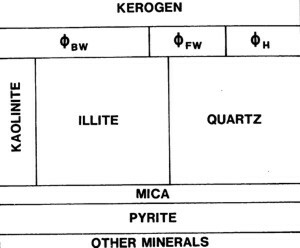 Clay, quartz, and dolomite volumes also have large ranges. This example shows a tight gas zone with moderate TOC (10% by weight according to the Passey method). 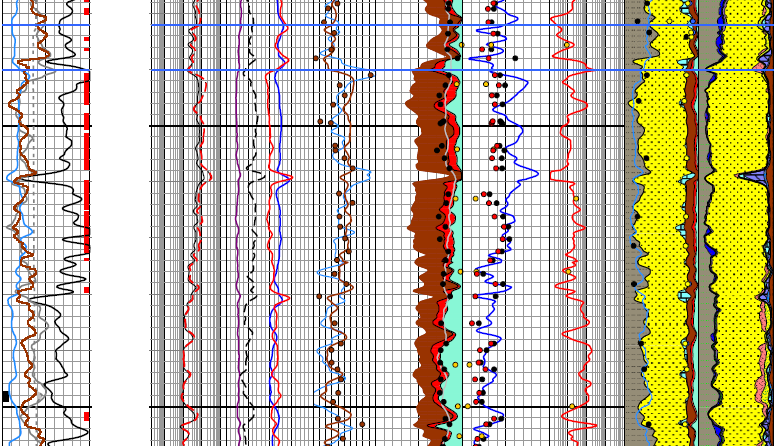 Some adsorbed and considerable free gas is indicated by the log analysis. The clay content is very low on XRD analysis, but the interval is radioactive and looks like a shale on logs. The upper half of this gas shale is really just a tight gas zone with decent porosity and very low permeability (see dots in porosity and permeability tracks). Most core perms are meaningless as no attempt was made to measure below 0.1 mD. This would not be tolerated today. There is a large amount of residual oil, reducing the space available for gas. Core Sw is lower than log analysis, possibly due to gas expulsion. Cap pressure is needed to calibrate Sw. The lower part of the rock is lower porosity and probably bitumen plugged, based on the extremely low Sw (black "pay" flag instead of red). We need a core to confirm this and some TOC and Gc values to see if the low Sw is kerogen or bitumen. 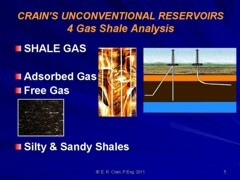 This example shows a tight gas zone overlain by a possible gas shale with less free gas. The clay content is very low. TOC is low in the tight gas and 3 to 4 times higher in the shale gas. The middle and lower zones are a tight gas with low clay volume (< 10%) and low TOC (< 3%), confirmed by TOC / Gc core data, The upper interval has higher TOC (6+%) and higher resistivity (lower Sw) suggesting it is a true gas shale. There is very little residual oil and perms were not measured. NMR total porosity (dotted line in porosity track) matches density-neutron and sonic porosity (blue line). NMR effective porosity (T2 cutoff > 3 ms -- not shown) is much lower, demonstrating the fine grained nature of this silt interval. Lithology agrees with dominant minerals and clay content in XRD report. A nuclear magnetic effective porosity curves (light grey on porosity track) shows a close match to shale and kerogen corrected effective porosity (left edge of red shading). Core porosity, NMR porosity, and corrected effective porosity match very well. The NMR is unaffected by kerogen and clay bound water can usually be removed from NMR porosity. The far right hand track is the mineralogy from an Elemental Capture Spectroscopy (ECS) log in weight fraction (excludes porosity but includes TOC). TOC from cores, Issler method, and ECS are in the track to the left of the porosity. They also match quite well. The ECS was also calibrated to TOC and XRD data to get a match as good as this. Clay volume in second track from the right is from thorium curve calibrated to XRD total clay, with clay volume from ECS superimposed to show the close agreement. Everything makes sense when you CALIBRATE to lab data but may be NONSENSE if you don't gather the right data.